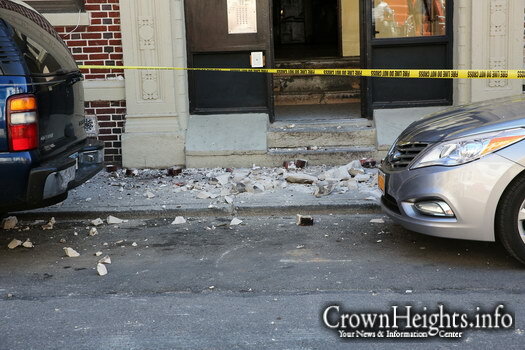 The incident occurred on Lincoln Place near Troy Avenue at around 2:30pm when a portion of a facade above a fourth floor window in 1226 Lincoln Place came loose and crashing to the ground, leaving large chunks of bricks, cement and rusted metal littering the sidewalk in front of the building. Miraculously there were no pedestrians walking by at the time and there were no reported injuries. 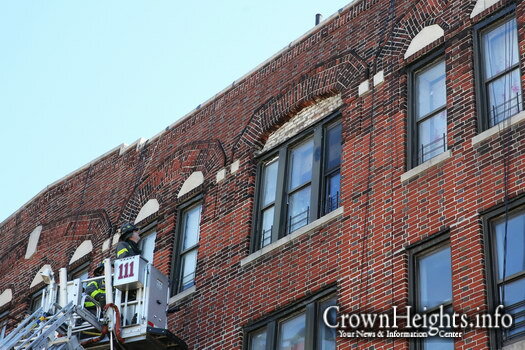 The debris appeared to have come from a section above the center windows of the fourth floor, above the buildings main entrance. The building, which has 31 residential units, was purchased in August of 2015 by Vinegar Hill Asset LLC for $7.13 million. Vinegar is an LLC which appears to be controlled by Inception Investors LLC, which describes itself as a “private real estate investment and operating company” and lists some 32 buildings with 403 units under its ownership. 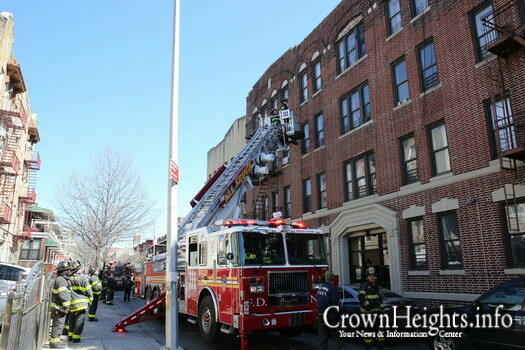 Their website lists three partners behind the LLC including Ryan Colbert, Cheskel Engel and David Lubin as co-founders and managing members, along with an address on 16th Street in Boro Park. This building has a long history of neglect and failure to properly maintain the nearly 100 year old building by both the previous owners and now the current owners. 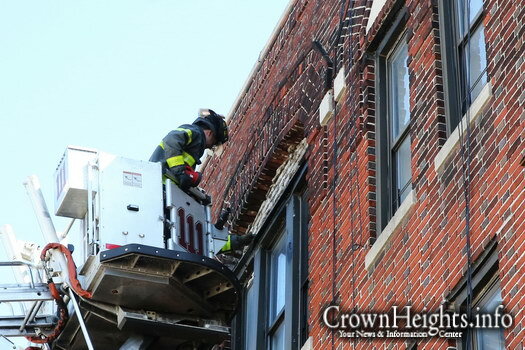 In December of 2008 a resident made a complaint to the buildings department about the very same bricks above the windows that were bulging. An inspector served a violation and a $1,000 fine, but no corrective measures have ever been recorded. Other defects that were noted over time were many issues relating to ailing brickwork, lead paint, and dangerous fire escapes. So much so that the city stepped in a number of times and order work be done on the most egregious issues, totaling over $50,000. 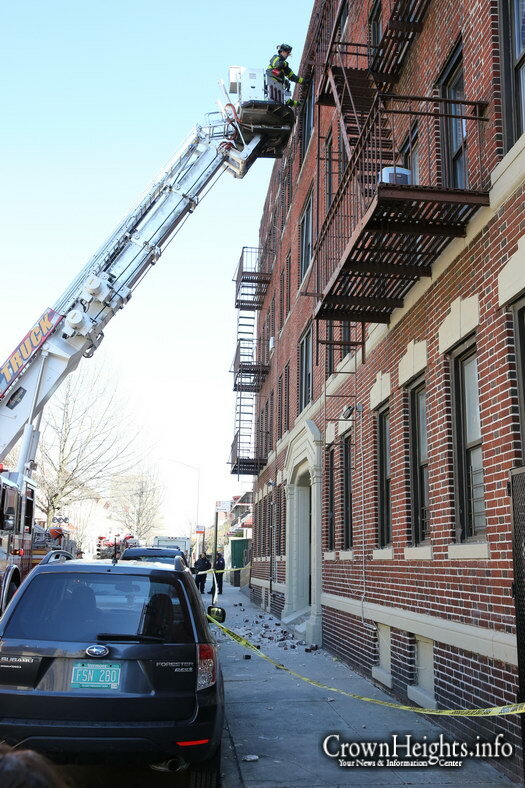 Using a bucket truck, firefighters ascended to the fourth floor windows where the facade collapsed and inspected it for further damage. The department of buildings was called to take over the investigation. 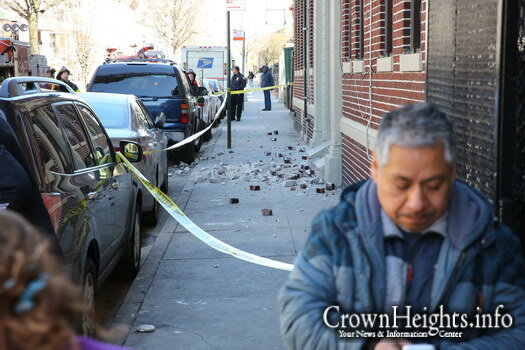 Comments Disabled To "Portion of Neglected Building’s Facade Collapses"
what is happening in 520 crown?? i live there now. repair are being done and the building is being maintained very well. do you have a personal issue with the owners? Throw them in jail – So what? The city should stop turning a blind eye to this, & prosecute them, people could have died. I wonder how much these 3 gave to de Blasio’s campaign?